Fiber is back once again with yet another debut event. Being one of, if not the, most innovative platforms out there, they’re stretching the boundaries of what we ever thought was possible. It’s a serious task, which is definitely not a walk in the park anymore these days. 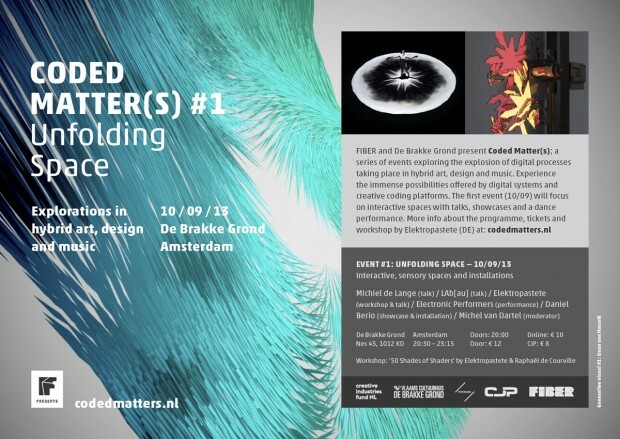 But this time we’re talking about Coded Matter(s), an exploration into the effect of digital breakthroughs in art, design and music. It’s a new series meant to show visitors the endless possibilities that are provided for us thanks to a number of insanely intelligent digital wizards. Cool stuff! We experience everyday life in completely new contexts. The first round will be devoted to Unfolding Space, an edition that focusses on the development of interactive and sensory spaces. With everything around us becoming more and more automated, we experience everyday life in completely new contexts. What does this mean for artists and designers and how do these new experiences of spaces affect their work? Intriguing enough for me to want take a look and check things out for myself. Who knows where we’re headed and how far ahead of us technology already is. I believe that big conglomerates worldwide are holding back and find earning money far more important than showing people what they’re truly capable of. Hopefully Fiber can offer us an insight into this during what will probably be one hell of an inspirational evening. Feature image: Daniel Berio’s ‘Graffitizer’.